If you stumbled upon this webpage chances are that you or a family member are experiencing some kind of back pain. Many people are unable to figure why they have it or why it comes and goes. Most, unfortunately, are lead to believe that this pain is “normal” or that medications can help cure a musculoskeletal problem. • Ignore It- This is risky- not knowing what’s wrong can cause you to engage in activity that can make the problem worse. Ignoring it can also let Spinal Degeneration take place and get worse. • Bed Rest- Giving your body rest when it isn’t feeling well is great, however, if you don’t know why you’re in pain you prolong the problem. By prolonging it to much, the further along Spinal Degeneration is going to take place, bringing you closer to irreversible damage. • Therapy- If the spinal joints are misaligned doing Physical Therapy can stress the joints further. Which could mean wasted time and money without getting rid of the pain. • Medicine- Medicine numbs the body. it doesn’t address the actual problem which can prolong the problem furthering Degeneration. This approach also has the possibility to create a habit out of pain relievers. • Surgery- On average 460,000 people a year progress to the point of Spinal Degeneration where they need surgery. Average cost of Spinal Surgery is $90,000 USD. Spinal Surgery is an intense process for your body to go through with a long recovery time. • Chiropractic- Over 30,000,000 people use Chiropractic each year to care for and heal their back pain. Chiropractic addresses the biomechanical stressors on your spine. By addressing this it gets rid of the problem causing your pain and it stops any degeneration that has been taking place. Y our spinal joints stack one on top of the other and are connected by the facet joint and disc. When a biomechanical injury happens to your spinal joint (accidents and overexertion are two common causes) a wedge forms, and the spinal joint is no longer in its proper alignment. This biomechanical stress on your joint can cause your spine to curve adding pressure on parts of your spine where there should not be. When joints are stressed they do not move properly. This can cause some muscles to stretch and overcompensate for the lack of motion in your spinal joint. If you’re experiencing muscle soreness this can be one of the causes. Another cause of muscle soreness and pain can be from an area that has been injured for a prolonged period of time. When an injury has been left untreated degeneration has begun to happen to your spinal disc and arthritis may have formed. This degeneration and arthritis can cause irritation and inflammation to the surrounding tissue. There is also the possibility that you have an injury to the disc itself, which can cause your tissue to inflame. Injured discs can also irritate your nerves causing pain and/or causing your muscles to spasm. 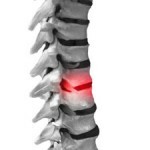 You can find more about Spinal Degeneration here. We first identify where the biomechanical problem is located, which at times, is not in the exact spot that the pain is. This is why we do a thorough examination of the entire spine. We then put together a personalized treatment plan for you. This is done because everybody’s injury is different. We use manual adjustments to correct the biomechanical problem. The specific adjustment technique we use is Gonstead. These adjustments address the spinal joints to get them back into proper alignment and back to their normal range of motion. By taking care of the biomechanical problem of your joint, you’ll feel your symptoms of pain disappear. This is because the painful inflammatory process of your body trying to constantly heal itself is stopped. Chiropractic is a drug free approach. No worries about prescriptions, addictions, or having to take time off from work when you use Chiropractic. Pain of any kind, at any age, is a sign that something is wrong. Since we can adapt, minor aches and pains are often shrugged off. While they may go away, if the underlying problem remains unattended, the problem may slowly worsen until it becomes more difficult and expensive to resolve. They relax the muscles which doesn’t address the problem. Chiropractors don’t dispense drugs. We rely on natural methods of healing and pain relief. If there is concern that you need additional medications such as muscle relaxers you can discuss this with the doctor. We have trusted doctors and specialist that we refer to if a Patient needs additional care. These days, most policies cover some of your care. If you do not have insurance or if you have one of the few insurances we do not take, we always work with our Patiences and develop a payment plan for you.